Excited and nervous that IM70.3 is only 10 days away. I plan on one last long session on Saturday then I’ll taper down next week. To bring new readers up to speed, this is my first long race without a stomach. Must of the nutrition and race day game plan has been untested. However – I feel good about the plan that is in place and has worked well with my training days. Stay tuned! I’ll post a link to track my live race times when it becomes available. Thank you for reading and reaching out with encouragement. It means more than you know. This event is free and there are still cheap hotels around the area. Let me know if you have questions! This morning I had a great morning ride/run with a friend. Beautiful Charleston weather and I felt decent, over all. Still a bit weak from the flu but happy with the results. Looking forward to the Race! Hope you follow along! Officially have the flu and already lost 5 pounds in two days. Can’t wait to feel better. I wasn’t able to get a key workout in so that’s a bummer too. I have a big Brick (50 mile bike/5 mike run) scheduled for Saturday so hope I’ll be full strength by then. 4 weeks out! Training is going well considering I have no stomach. I hope to make more short posts in the near future to keep everyone updated. It’s been a year since my total gastrectomy. It flew by. I can’t believe where I am today. Although I’m very thankful for where I am, I still see I have a lot “healing” to become who I want to be. For example – I went from 207 to 156 lbs and I’m hovering around 157 now. I’d like to build some muscle and get back to 165 or so. But – it’s been harder than I thought. I also want to get back into regular training for triathlon and marathon. In order to do that, I have to have my eating dialed in and I need more sleep to recover from workouts. I used to rarely get sore, now I get sore after a decent workout. No big deal, but I need to do better at planning. I have a 70.3 IronMan coming up in April and training is underway. After taking Nov/Dec off, I have lost a good bit of fitness. So – I’m going to have to be very disciplined to do this. Stay tuned! 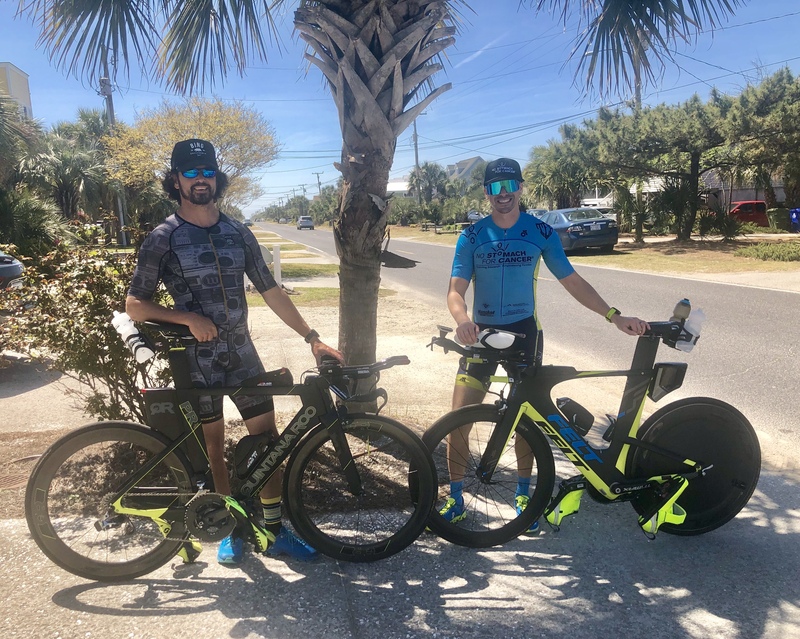 Had a really fun time at the Kiawah Island Triathlon this weekend. Had a great race and I was 3rd in my age group! On another note, hurricane Florence impact in Wilmington North Carolina to such a degree that they had to cancel the IronMan 70.3 triathlon. So I must change my registration for a similar race in April. I might run a half marathon or marathon of the holidays to stay in shape. Stay tuned! Finished a 10 mile run as I prep for IM70.3. Getting there. Looks like the hurricane has us leaving town so I got one last run in. I’m hurting post run, but I’m not surprised. Hope the IRONMAN 70.3 isn’t cancelled because of the hurricane. IRONMAN 70.3 training is in full swing and I’m close to peaking (in 3 weeks or so). I feel things are coming together, although, the training methodology is much different than that of the past. Rather than have aerobic days/recovery days, I take full days off. The reason is because I’m too sore to even do a recovery run or whatever. Hope it all works out. I swam 1,500 meters this week and biked 40 miles. Felt pretty good overall. Yesterday – I felt really good and wanted to see if I have improved my fitness. Thus – I ran a 5K to test my time and by my surprise, I did improve and had a new PR post total gastrectomy. I think I could have still been about 30 seconds faster but I’m not mad. My future goal is sub 20 min 5K. There is a possibility that I’ll do the Kiawah Olympic Triathlon on Sunday (one week from today). However, there is a hurricane coming our way so the race might get pushed back.